This article is about the capital of Colombia; for the town in the United States, see Bogota, New Jersey. Nickname: "Athens of Latin America"
*Bogotá is physically within and is the capital of Cundinamarca Department, but as the Captial District is treated as its own department. Originally called Bacatá by the Mexicas, it was the centre of their civilization before the Spanish explorers colonized the area, and it sustained a large population. The European settlement was founded in August 6, 1538, by Gonzalo Jiménez de Quesada and was named "Santa Fé de Bacatá" after his birthplace Santa Fé and the local name. "Bacatá" had become the modern "Bogotá" by the time it was made the capital of the Viceroyalty of New Granada, which was then part of the Viceroyalty of Peru, and the city soon became one of the centers of Spanish colonial power and civilization in South America. In 1810- 11 its citizens revolted against Spanish rule and set up a government of their own, but had to contend with internal divisions and the temporary return to power of Spanish military loyalists, who reassumed control of the city from 1816 to 1819, when Simón Bolívar captured it after his victory at Boyacá. Bogotá was then made the capital of Gran Colombia, a federation combining the territories of modern Panama, Colombia, Venezuela, and Ecuador. 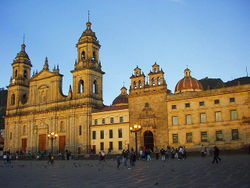 When that republic was dissolved into its constituent parts, Bogotá remained the capital of New Granada, which later became the Republic of Colombia. See History of Colombia. In 1956, the municipality was joined to other neighboring municipalities forming a "Special District" (Spanish: Distrito Especial). With the Constitution of 1991, Bogotá was confirmed as the Capital of Colombia acquiring the name "Santa Fe de Bogotá", and changing the category from Special District to "Capital District" (Spanish: Distrito Capital). In August 2000 the capital's name was officially changed back from "Santa Fé de Bogotá" to the more usual "Bogotá". Bogotá Capital District The local government consists of a Capital District, the current chief of government is Luis Eduardo Garzón. The flag originates from the insurgency movement against the colonial authorities, which began on July 20, 1810. During this insurgency, the rebels wore armbands with yellow and red bands, as these colours were the ones in the Spanish flag which was the one used as the flag for the New Kingdom of Granada. In October 9, 1952, exactly 142 years after these events, decree 555 of 1952 officially and definitively adopted the patriotic armband as the flag of Bogotá. The flag itself is divided horizontally in two, the top band is yellow and the bottom band is red. The yellow colour denotes the gold from the earth, as well as the virtues of justice, clemency, benevolence, the so-called "mundane qualities" (defined as nobility, excellence, richness, generosity, splendour, health, steadfastness, joy and prosperity), long life, eternity, power and constancy. The red colour denotes the virtue of charity, as well as the qualities of bravery, nobility, values, audacity, victory, honour and furor, Colombians call it the blood of their people. The coat of arms of the city was granted by emperor Charles V (Charles I of Spain) to the New Kingdom of Granada, by royal decree given in Valladolid, Spain on December 3, 1548. It contains a black eagle in the centre, which symbolises steadfastness. The eagle is also a symbol of the Habsburgs, which was the ruling family of the Spanish empire at the time. The eagle is crowned with gold and holds a red pomegranate inside a golden background. The border contains olive branches with nine golden pomegranates in a blue background. The two red pomegranates symbolize audacity, and the nine golden ones represent the nine states which constituted the New Kingdom of Granada at the time. In 1932 the coat of arms was officially recognized and adopted as the symbol of Bogotá. The lyrics to the anthem of Bogotá were written by Pedro Medina Avendaño, the melody was composed by Roberto Pineda Duque. The song was officially declared the anthem by decree 1000 of July 31, 1974, by then Mayor of Bogotá, Aníbal Fernandez de Soto. Bogotá is located in the centre of the country, on the eastern of the "sabana de Bogotá", 2640 meters (8661 feet) above sea level. Although "sabana", as it is popularly called, is literally "savanna", the geographical site is actually a high plateau up in the Andes mountains.. The Bogotá River crosses the 'sabana' forming Tequendama falls to the south. Tributary rivers form valleys with flourishing villages, whose economy is based on agriculture, livestock raising and artisanal production. The 'sabana' is bordered to the east by the Eastern Cordillera of the Andes mountain range. Surrounding hills, which limit city growth, run from south to north, parallel to the Guadalupe and Monserrate mountains. The western city limit is the Bogotá river; Sumapaz paramo borders the south and to the north Bogotá extends over the metioned plateau up to the towns of Chía and Sopó. The average temperature on the 'sabana' is 14.0°C, varying from 9 to 22ºC. Dry and rainy seasons alternate throughout the year. The driest months are December, January, February and March; the rainiest are April, May, September, October and November. 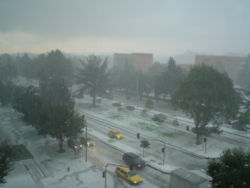 June and July are usually rainy periods and August is sunny with high winds. Climatic conditions are irregular and quite variable due to the El Niño and La Niña climatic phenomena, which occur in and around the Pacific basin and are responsible for very pronounced climatic changes. The urban layout dates back to Colonial times, and is a square layout adopted from Spain. The current street layout has calles which run perpendicular to the hills heading east-west with numbering increasing towards the north, and towards the south from calle 1, and carreras which run parallel to the hills in the south-north direction with numbering increasing east and west from carrera 1. 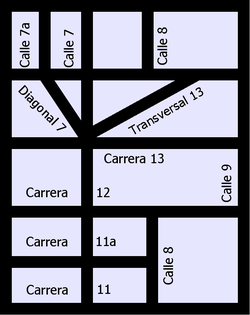 New urban sectors incorporate diagonal – similar to streets – and transversal – similar to carreras. Streets are numbered. It has over one thousand neighborhoods or divisions forming the developed urban network. Neighborhoods of higher economic status are primarily located to the north and north-east. Poorer neighborhoods are located to the south and south-east, many of them squatter areas. The middle classes usually inhabit the central,western and north-western sections of the city. The largest and most populous city in Colombia, Bogotá has 7,321,831 inhabitants (2005 census). Bogotá is the capital of the Republic of Colombia, and houses the national legislature, the Supreme Court of Justice , and the centre of the executive administration as well as the residence of the President of the Republic. The Principal Mayor and District Council – both elected by popular vote – are responsible for city administration. The city divided into 20 localities: Usaquén, Chapinero, Santa Fe, San Cristóbal, Usme, Tunjuelito, Bosa, Kennedy, Fontibón, Engativá, Suba, Barrios Unidos, Teusaquillo, Los Mártires, Antonio Nariño, Puente Aranda, La Candelaria, Rafael Uribe Uribe, Ciudad Bolívar, Sumapáz. Each of the 20 localities is governed by an administrative board elected by popular vote, made up of no less than seven members, as determined by the District Council. The Principal Mayor designates local mayors from a trio proposed by the respective administrative board. Bogotá is Colombia's largest economic centre, followed by Medellín, Cali, and Barranquilla. 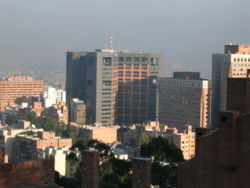 Most companies in Colombia have their headquarters in Bogotá, as it is home to most foreign companies doing businesses in Colombia as well as Colombia's main stock market. Bogotá is a major centre for import and export of goods for Colombia. Bogotá is the hub of Colombian business. It has a busy banking and insurance sector and a Stock exchange. Engineering firms provide services for many regions of Colombia and Central America. 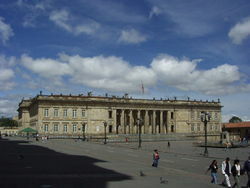 Bogotá houses the central governmental institutions and military headquarters. It is the centre of the telecommunications network and has the biggest industrial facilities in the country. Some services are public and others are private. The public services include energy, sewer and phones. Energy and sewer bills are stratified based on the location of owner's residence. Thus, the wealthier sections of society help subsidize the energy bills of the poorer sections of society. Telephone service is provided by both "Empresa de Telecomunicaciones de Bogotá" (ETB), a city-owned company, and "Capitel", owned by Colombia Telecomunicaciones and "EPM Bogotá", owned in turn by the Medellín public services company (Empresas Públicas de Medellín - EPM) . Coin or card-operated payphones are also available, along with cell phone providers. There are (as of May 2005) three main operators of wireless phones: Movistar (owned by Spanish firm Telefónica), Comcel (owned by Telmex) and Ola (co-owned by ETB and EPM). Bogotá also receives money from exports like flowers and emeralds. In downtown Bogotá, millions of dollars in domestically produced rough and cut emeralds are bought and sold daily. Other important industries include financial services, especially banking. Bogotá is headquarters to major commercial banks, and to the Banco de la República, Colombia's central bank. 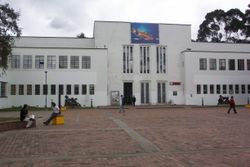 Bogotá is also a printing and publishing centre. The city is a major convention destination with many major convention centers: Centro Ferial de Convenciones Corferias, Centro de Convenciones y Eventos Cafam, Centro de Convenciones Gonzalo Jiménez De Quezada, among others. Because of its status as site of the country's capital, it is home to a number of government agencies, which represent another major component of the city's economy. The city's industrial base include staples of the Colombian economy such as GM Colmotores, Compañía Colombiana Automotriz, and Ecopetrol. Street arrangement of Bogota based on the Cartesian coordinate system. 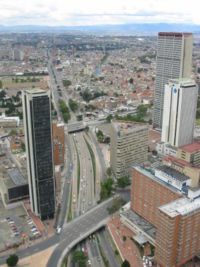 Bogotá is a modern city with a modern transportation system. It includes an international airport, bus lines, taxis, the TransMilenio bus rapid transit system, and even a train that serves as transportation for the outskirts of the city. In addition, Bogotá has several types of taxis. Yellow taxis (cabs) are by far the most common. People often use them in order to get to their destination faster, although they are more expensive. Bogotá also has white taxis, used mostly as shuttles by hotels or companies to transport customers. Bogotá's principal airport is El Dorado International Airport. Several national airlines ( Avianca, AeroRepública, AIRES and SATENA), and international airlines (such as Iberia, American Airlines, Varig, Copa, Continental, Delta, Air Canada, Aerogal, TAME, TACA) operate from El Dorado. Bogotá's airport is one of the largest and most expensive in Latin America. Because of its central location in Colombia and America, it is preferred by national land transportation providers, as well as national and international air transportation providers. Currently, a major expansion of El Dorado airport is in the planning stage. This stage will be finished on January 2008. Bogotá is a hub for national and international bus routes. This terminal serves routes to the majority of cities and towns in Colombia and is the largest in the country. International services are provided to Ecuador and Venezuela by certain bus companies. TransMilenio is a bus rapid transit system, a network combining modern articulated buses that operate on exclusive roads (busways) and smaller buses (feeders) that operate in residential areas, bringing passengers to the main grid. TransMilenio's main routes are: Caracas Avenue, 80th Street, Avenue of the Americas, Northern Highway (Autopista Norte), Jiménez Avenue, and 30th Avenue (also referred to as Norte Quito Sur or N.Q.S. for short). The Suba Avenue routes and the southern leg of the 30th Avenue route were opened in April 2006. The third phase of the system will cover 7th Avenue, 10th Avenue, and 26th Street (or Avenida El Dorado). The system is expected to cover the entire city by 2030. The Transmilenio rapid bus service is extremely cheap, clean and efficient and carries commuters to numerous corners of the city. While the Transmilenio is expansive, there are some main routes that are not yet reached. As in any other highly crowded area, users of TransMilenio must be aware that when riding the system they are exposed to pickpockets. Isolated instances of people getting mugged have been reported as well. Security on buses and in stations is handled by police officers employed by the city. However, most of the time the officers assigned are recently graduated highschool students serving their mandatory year with the armed forces ('Policía Bachiller'). Higher ranking officers are assigned as supervisors and respond when a Policía Bachiller requests assistance. Bogotá's network of bike paths, also called ciclorutas, is one of the most extensive dedicated bike path networks of any city in the world, with a total extension of 303 km. It extends from the north of the city, 170th Street, to the south, 27th Street, and from Monserrate on the east, to the Bogotá River on the west. The cicloruta was started by the Antanas Mockus administration (1995-1998), and considerably extended during the administration of Mayor Enrique Peñalosa. On Sundays, many people ride a popular tourist train with their family. On weekends, the train runs from Bogotá to Zipaquirá and Nemocón, towns on the outskirts of Bogotá. A lack of security on bike paths has caused many would-be riders to search for more traditional means of transportation. Bogotá's colleges and universities have a major impact on the city and region's economy. Not only are they major employers, but they also attract national and international industries to the city and surrounding region, including highly needed technology industries. The city is Colombia's educational "Mecca"; it boasts more schools, colleges, and universities than any other city in Colombia. There are many parks and most of them have facilities for concerts, plays, movies, storytellers and other activities. "Simón Bolívar Metropolitan Park", for instance, is a big park which is regularly used to stage free concerts (such as the annual Rock al Parque, a free festival in which new and popular Latin rock bands play for free). The park is also frequented in the month of August and used for kite flying, a national tradition. 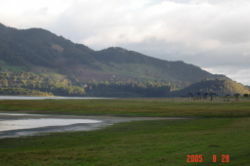 Another public park is Parque Nacional (National Park), one of the biggest in Bogotá. The park has many trees and green spaces, as well as ponds, games for children, many foot and bicycle paths, and venues for entertainment such as public screenings of movies and concerts and events organized by the Council of Bogotá. It is located between two main streets, the Circunvalar Avenue and the 7th Avenue. 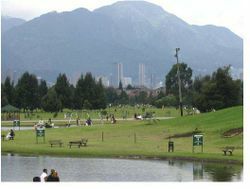 There are many other parks around the city of Bogotá. Each neighborhood has its own park. Some of these parks are private and others are public. Some private parks demand that people from the neighbourhood have a card to be able to get into the park. Public parks are for everybody. Some of them have watchmen. These parks also have sporting venues, which provide sports programs for children and adults, such as volleyball, basketball, taekwondo, football (soccer)|football, and other sports. The most active park (in both leisure activity, promotion of high-end products and nightlife) is the "Parque de la 93" located between 93rd and 93Ath street, and 12th and 13th avenue. Several of the top restaurants and bars in the city are located in this park or in the "Zona T" (T-zone) in the 82nd street. Recently, restaurant activity has begun in the "Zona G" (69th and 70th Streets, in the Los Rosales zone) and La Macarena. Bogotá has not only natural parks but also amusement parks like Mundo Aventura and Salitre Mágico. There is a special rate to get into these parks and people have to buy tickets to be able to play mechanical games. Mundo Aventura park has mechanical games such as sky-coaster, roller coaster, hammer, and other adult amusements. For children there are some mechanical games like little roller coaster, carousel, turtles, and so on. In this park, people can find both amusements and nature, with animals such as goats for children to feed. 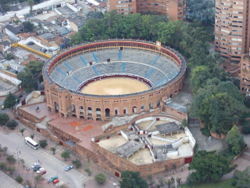 Besides, there is a "Cerdodromo", which is a place where pigs race. The other amusement park is "Salitre Mágico", which is one of the entertainment centers for children and adults. The are many mechanical games like pirate ship, apocalypse, 3 roller coasters and other games. The park is next to the Simón Bolívar park, which is a well known place in Bogotá (used also for concerts through the year). For relaxing and finding peace from the stress of city life, the Parque del Chicó, with trees, gardens, artificial creeks and ponds, and a colonial style house converted into a museum, is worth a visit. Not so far from the city, up north, the Parque Jaime Duque offers a cultural encounter for visiting families. It has rides, a giant map of Colombia, popular exhibits, and a zoo. A big hand holding the world symbolizes God, and a reproduction of the Taj Mahal provides a picture collection with reproductions of famous paintings. 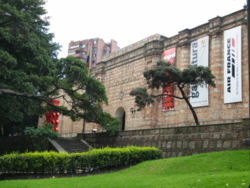 Bogotá has an interactive museum of sciences called Maloka. Bogotá hosts the Iberoamerican Theatre Festival, the biggest theatre festival in the world, every two years. 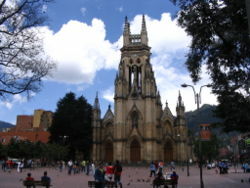 Bogotá is also known as the Athens of Latin America, given the locals' penchant for education and manners. 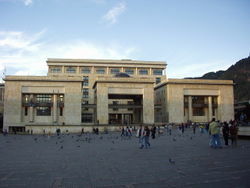 In 2007, Bogotá will be the Book Capital of the World. The city also celebrates the International Book Fair, one of the three major book fairs of the Spanish-speaking Americas. The tallest building in the city is the Colpatria Tower. The former motto of the city was "2600 metres closer to the stars" (in reference to its altitude above sea level). The city has institutionalized a day without cars on the streets, called "El Día sin Carro" (The day without cars). It takes place every first Thursday of February. See Car Free Days and United Nations Car Free Days. Bogotá has the highest quality as well as the most expensive potable water in Latin America. The Federal District as a whole has the largest economy in Colombia and ranks eighth in Latin America. The Gold Museum has the biggest gold handicraft collection in the world. Bogotá has one of the most extensive dedicated Bike Paths Network of any city in the world, with a total of 300km.